Achieving the perfect smile is an American dream nowadays, but that wasn’t always the case. In fact, historical evidence proves our ancestors as far back to the cavemen days had what so many of us would consider a practically flawless set of chompers. The main reason for the natural dental imperfection is because the jaw becomes smaller as humanity evolves. 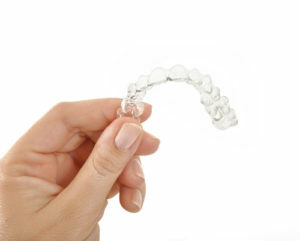 An easy and effective modern solution to that problem is to straighten your teeth with Invisalign. But what’s the big deal with crooked teeth and how can your Red Bank New Jersey Dentist help you spring into a new smile? Almost all kids have some form of dental issue whether it’s malocclusion (crooked teeth) or a diastema (gap). The jaw and teeth strengthen, adjust, and set as we age and some people are fortunate enough to grow out of those issues. However, most dental concerns increase or get worse with time. Almost 5 million Americans at any given time wear braces and 80% of those are kids between the ages of 6 and 18. Up to 70% of adolescents will wear metal braces before they reach adulthood. Of course, braces aren’t right for everyone and Invisalign offers a clear alternative to the traditional rite of passage. Crooked teeth cause the jaw to shift and can lead to abnormal wear of the mandible. A weakened jawbone can create bite issues and lead to internal stress which can result in bruxism or TMJ. Invisalign can easily treat even serious bite issues and the aligners can work as mouth guards to protect your teeth from further damage due to habitual stress-related grinding. As the treatment progresses, your jaw can repair itself and realign as you straighten your teeth with Invisalign. Tooth decay doesn’t care about age, gender, race, or creed. In fact, it’s so prevalent that over 90% of Americans have cavities and that number soars to 96% in adults over the age of 65. However, bacteria doesn’t just eat away at the teeth. It can attack any surface inside the mouth, including the gums. Poor oral health care and the resulting build-up of bacteria is the primary cause of gum disease. And that’s nothing to smile about. Gum disease begins as gingivitis which involves sore, red, and inflamed gums. That stage is easily treatable if caught early enough. But crooked teeth encourage the bacteria by providing it with extra living spaces. Invisalign can straighten your teeth and help reduce the risks for bacteria-related oral health problems. According to a national survey, 99.7% of Americans admit to believing a good smile is a necessary social asset while 96% of adults said an attractive smile increases that individual’s romantic potential. Continuing on that vein, around 75% of Americans believe a person’s smile can improve or impede their career success. In fact, when it came to what they first noticed in another person’s smile, straightness of their teeth was mentioned more often than the shade or cleanliness of their teeth, the sincerity of their smile, or even the presence of missing teeth. Give your Red Bank New Jersey Dentist a call to see how springing into a new smile with Invisalign can help improve your life.